I know most of us are in that Christmas stage where we don’t know what day it is but it is Friday, so even though time off means more posts from me, here’s my weekly Friday one! Some time in October I acquired quite a lengthy amount of pink gingham cotton. My sister-in-law and I were talking about how it reminded us of the cutest little PJs that my niece, Grace, had when she was tiny. So, I couldn’t not replicate them. Luckily for me there was a sale on a simplicity so I bought this girls and boys pyjamas pattern (1575). The pattern starts at aged 7 and goes up to 14, Grace is only 5 but nearly 6 and rather tall! I decided to cut two lots out at the the same time, because you can’t get enough PJs when you’re 5! I just made one set of sleeves shorter and customised them to make them individual, as you will see. I wanted traditional, hence the button up style PJs but I was concerned because I’ve never done a button-up shirt before. I needn’t have worried though, the pattern was so easy to use. I read through the instructions first and decided to scrap the facings and I used a bright pink binding on one and just hemmed the other and used the binding on the back neckline. The tops went together so easily and I chain stitched through the two in no time. 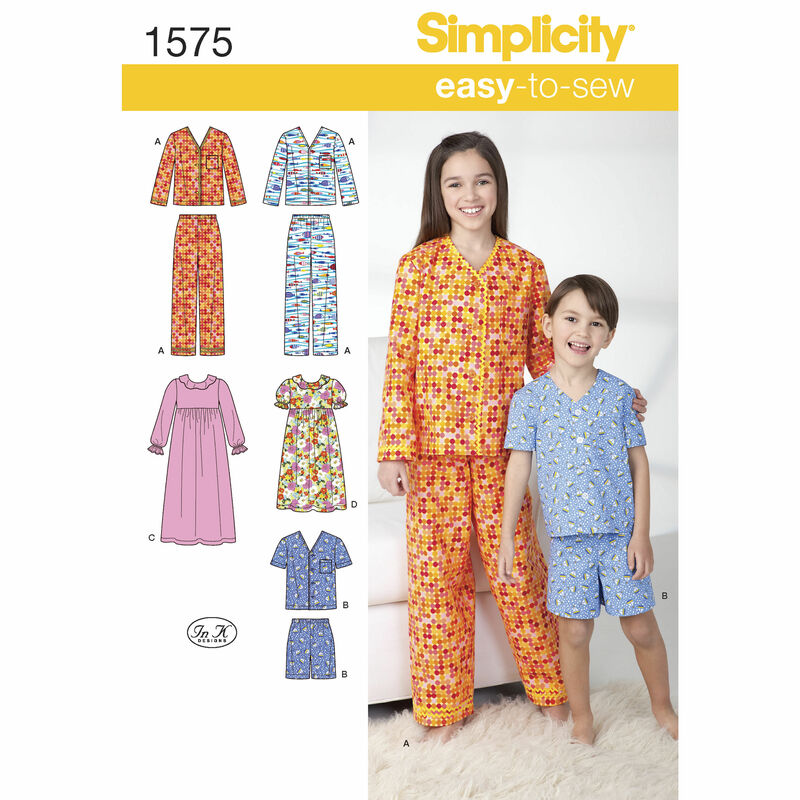 There was a brilliant button guide pattern piece that made the buttons really easy to do. The trousers came as all in one leg pieces and were so simple for it, they literally took me 15 minutes. I did have to wing the elastic waist measurement slightly though, as said child was not on hand! So that was it for construction, but I had so much fun customising these. Obviously I used a bright pink bias binding so they look interesting straight away. 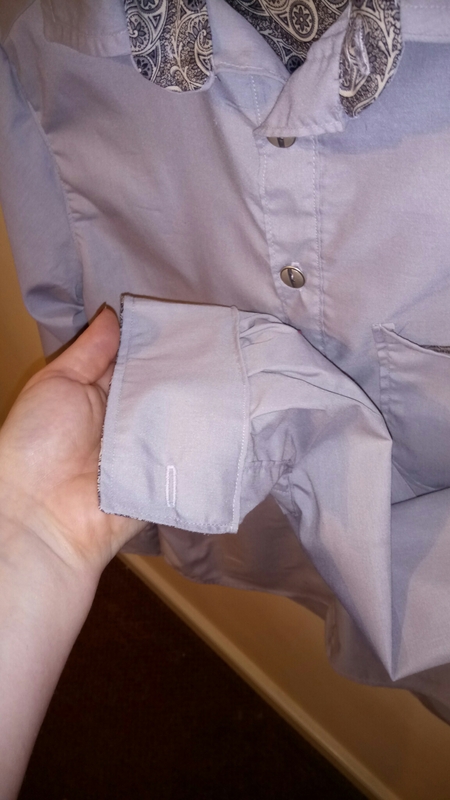 I put a pocket on one with a cute bit of white ric rac. I wanted these to be more traditional so I used pink buttons and left it at that, apart from this cute label I hand stitched for the inside. The second pair have a shorter sleeve, I bought these iron on letters from Drift in Seahouses ages a go and have been waiting for something to put them on and I’m so pleased they go really well and look great! I used yellow buttons on this too as a contrast. I love that I have been able to make these PJs personalised for Grace. She wore them on Christmas Eve and her Mum was made up with them! They are a little big but that only means she’ll be in them longer, which doesn’t happen with anything these days! She’s the perfect little model! 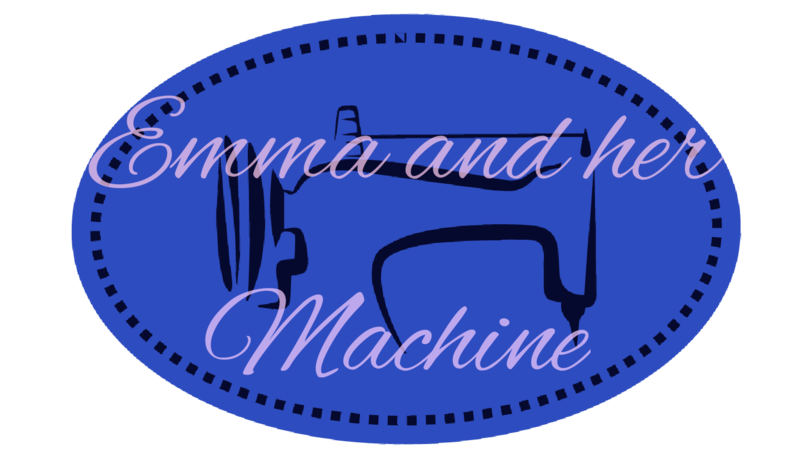 AND… we bought her a sewing machine for Christmas! Can’t wait to have a go at this with her! She was so excited! I hope everyone has a Happy New Year and best wishes for success and happiness in 2017. Only a few more Christmas pressies to share in 2017 and then normal service will resume!! I don’t know whether I’ve discussed this but I love Christmas. I have all the Christmas clothes and accessories and last year when I shipped up to my Mum’s in my gingerbread swing dress my brother looked at me like he wished he was adopted or maybe that I was. As I’ve discussed, I love a bit of geek/cheesiness, whereas he looks like he’s stepped out of a rock band half the time. So I thought I would tone it down slightly this year…. 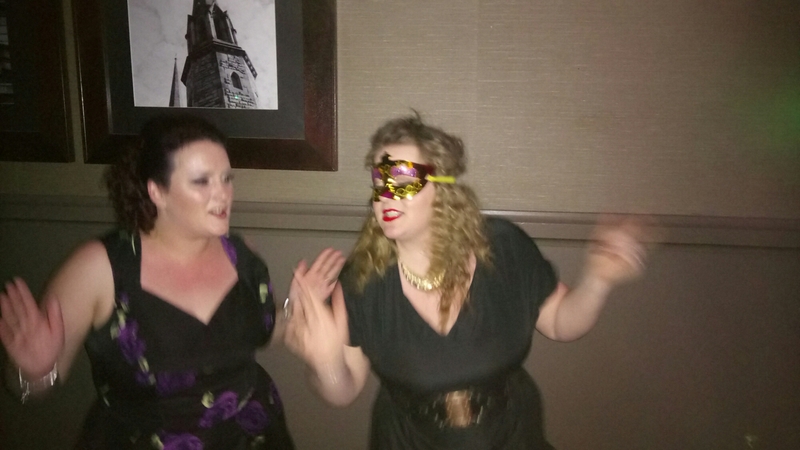 note I said slightly… I also wanted a dress which would fit better! I thought it would be really apt to use my New Look 6393 (previously 6020) that my Mum bought me for Christmas last year. It was the first pattern I owned and really sparked my passion for sewing and fuelled my whole year of learning to sew clothes. I have tried this pattern a few times over the year, not always successfully as the bodice would gape (see here) and on others it was too tight, so I was determined to get this right. I used the muslin to line it as I felt a dress I will probably only wear once (possibly twice) a year would be the perfect opportunity for me to practice lining techniques. I used a thicker maroon coloured fabric to cut the skirt pieces, though I tapered it down slightly down the sides. 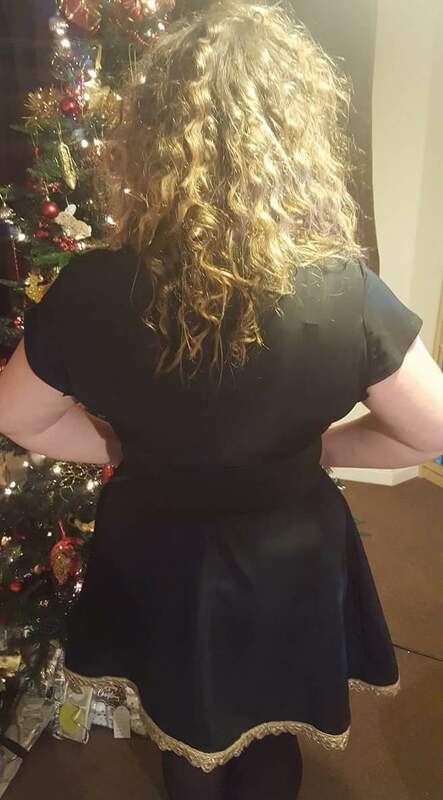 I used a longer length, which I’m pleased with too, as it is sleeveless but it is winter so I wanted a bit more fabric in the length. 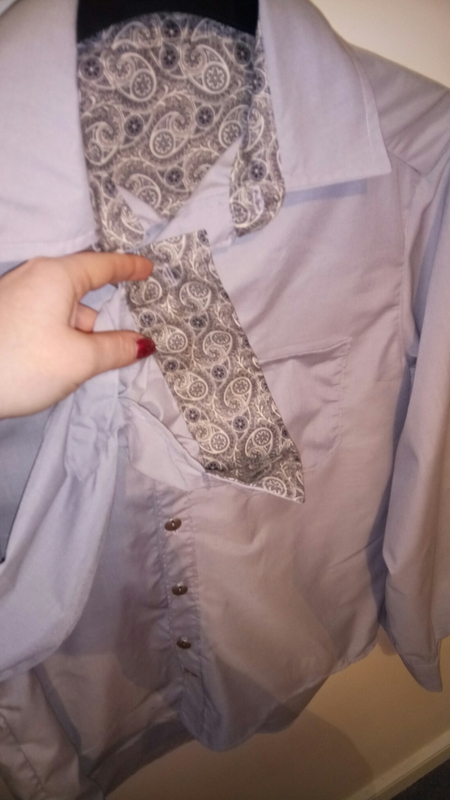 I wanted to use a plain fabric for the bottom so that it would be a little more subtle. Both the pieces of fabric were in a bundle from Abakhan so this was a super cheap make and a good way to use the smaller pieces. 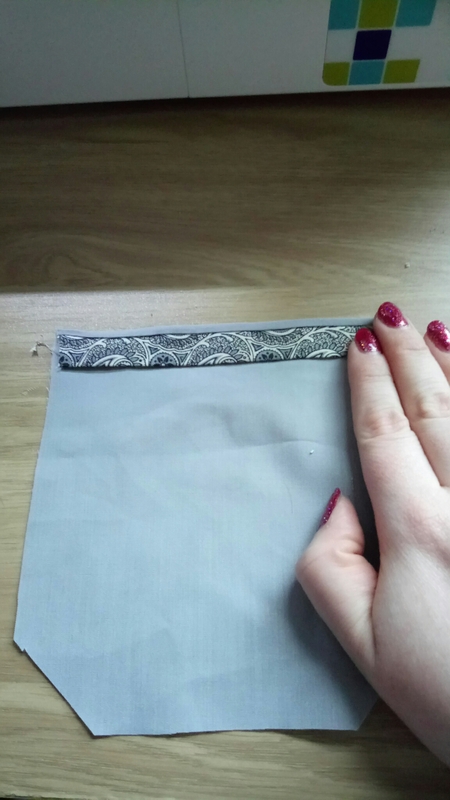 The lining worked really well and I love putting the skirt panels together, I find stitching lengths like that really relaxing. I intended to put a zip in but was able to just slip in to it. 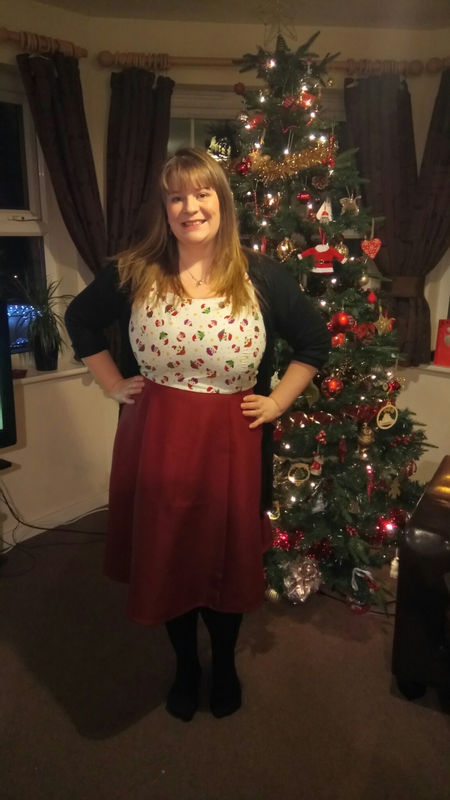 I even used a Christmas ribbon on the hem! Finally a dress which fits well! 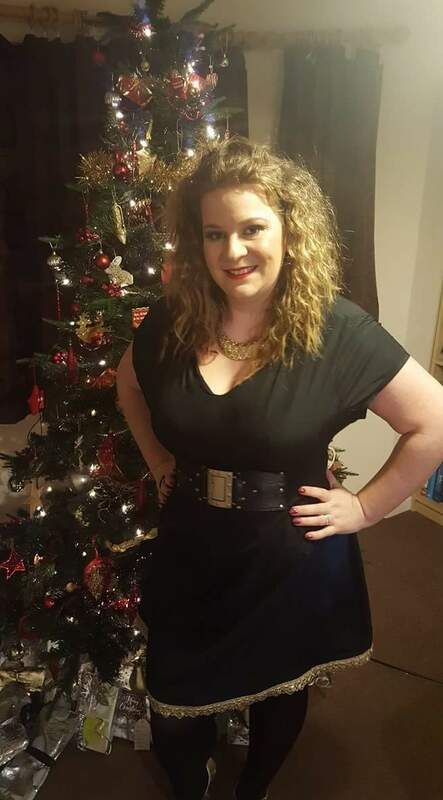 It’s perfect and Christmassy and I wore it with pride at our Boxing Day party! I know I said it was brother approved and by that I mean he didn’t say ‘what on earth are you wearing?’ so that’ll do for me! I hope you’ve all had a nice Christmas. 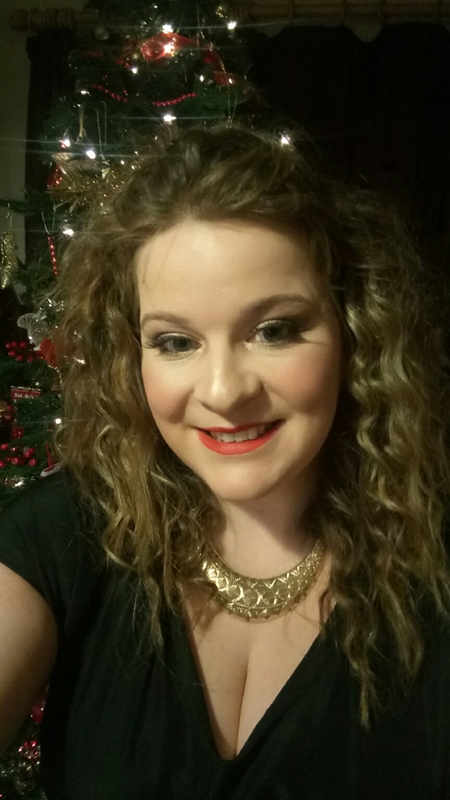 So, this is my second blog in 2 days because I got published in Sew Magazine! I’m so excited! It’s a bookazine called Sew Style: Stitch Your Size and comes with 3 Butterick Patterns. Anyway, today’s blog offering is the Simple Sew English Tea Dress. 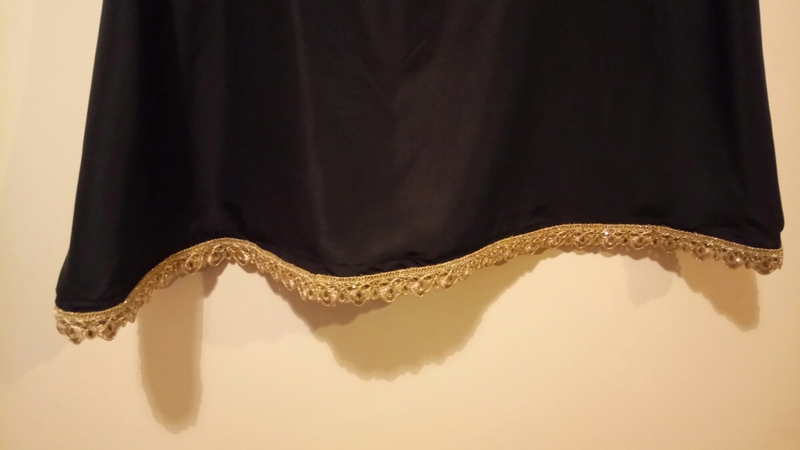 I wanted a black dress for the Christmas Party, which I could customise and make nice and Christmassy with this beautiful gold trim – note, I can’t actually go to my Christmas Party so I actually joined my sister-in-laws! 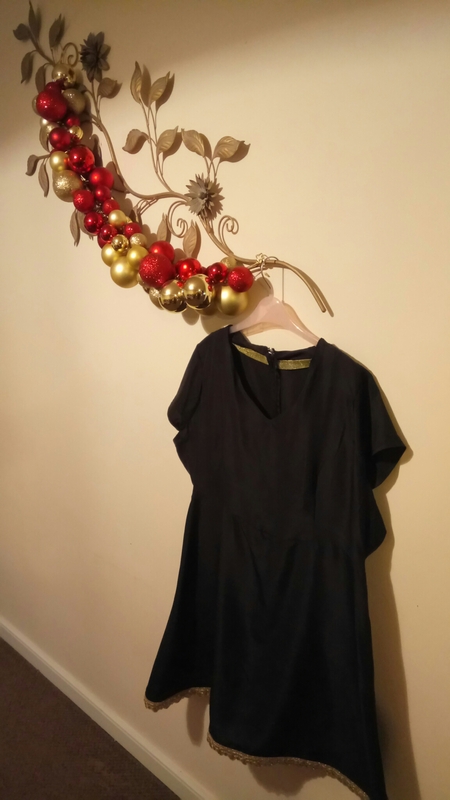 I bought a lovely, drapey black viscose dress fabric from the local market and 2 metres of it just covered this dress (luckily I wanted to have a go at the little fluttery sleeves that are featured anyway!). The pattern came together quite quicky, there’s darts in both the front and the back pieces which gives it a really nice shape. I stuck with the facings for this and soon remembered why I usually avoid them. They just don’t sit right… As this was my Christmas dress I used gold ribbon as a binding on the facings before sewing them in place. As usual, they were far too eager to pop out so I settled for some tacking stitches at my shoulders and moved on. I thought that would be my mission complete, however it was too tight on the chest… Not unheard of, sadly. So in my determination, I opened up the side seams and inserted a triangular panel at both sides to give me a bit more room. This makes the shape of the sleeves look a little more wide but I don’t think that’s a bad thing. I had left the dress very last minute, I’ve had it cut out for ages but the party date just crept up on me! Anyway, because I was rushing slightly, I didn’t have a long zip so I had to use a 9 inch one… luckily I had cut the back piece on the fold; it meant I didn’t have to cut in in half to insert a zip. and it does make it look smoother. It does mean I have to wiggle in to it a bit but it’s no big deal. The picture on the pattern shows a V-shaped dip at the waist but I found the pattern doesn’t allow for this as much as it suggests. 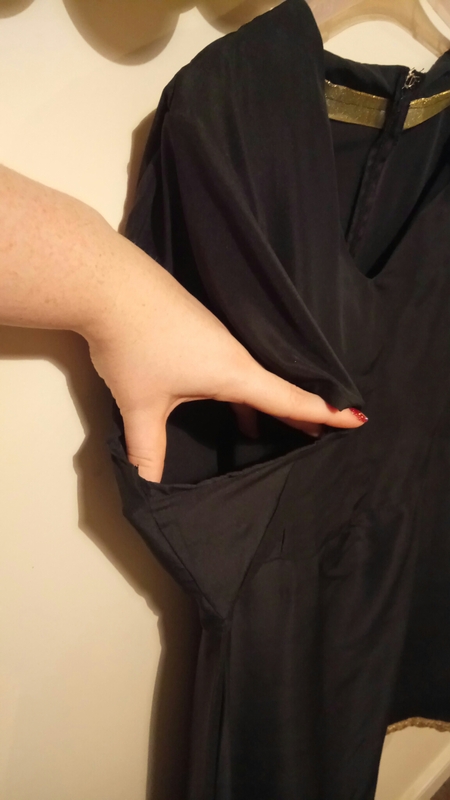 I inserted the cute little tulip shaped sleeves (it comes with 3 options) and then hemmed it, which was an absolute nightmare; it seemed to press nicely and then it stretched and went wonky as I was stitching. Luckily I was adding my gorgeous gold trim to the bottom so I wasn’t too stressed about it… I think I would have done some unpicking otherwise. 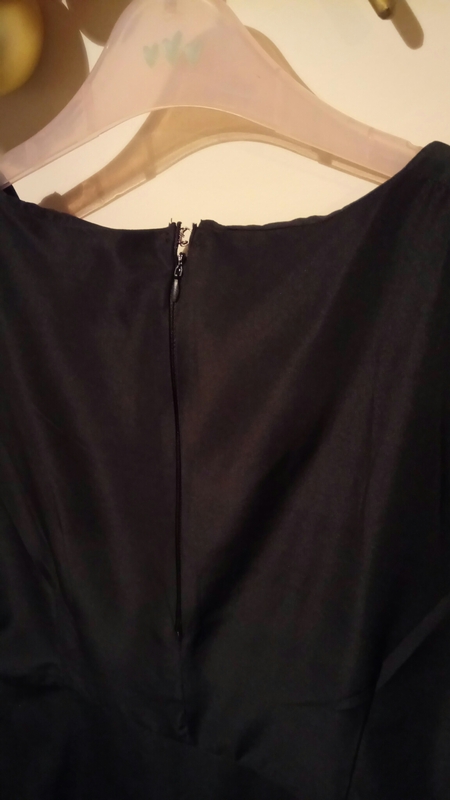 Anyway, I pinned and sewed the trim along the hem with the design slightly overlapping the edge. 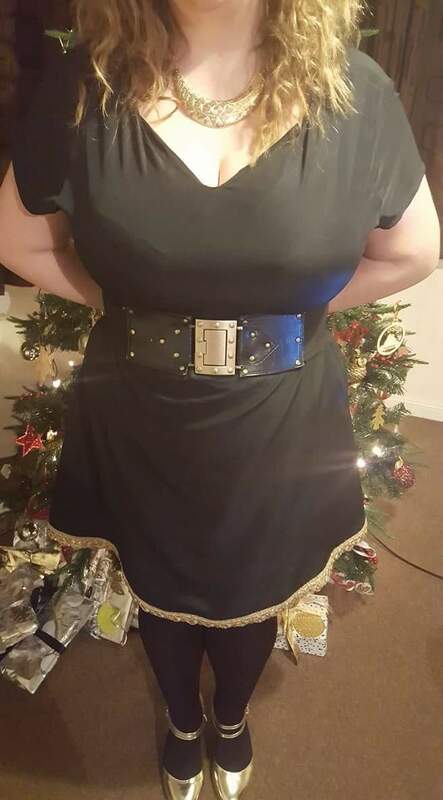 I toyed with the idea of adding the trim elsewhere and pinned it along the neck and the waist to try it but decided against it in the end… I think my hubby’s words were ‘you have issues with simple being better don’t you?’ I do think it looks effective and more classy and not too OTT this way. 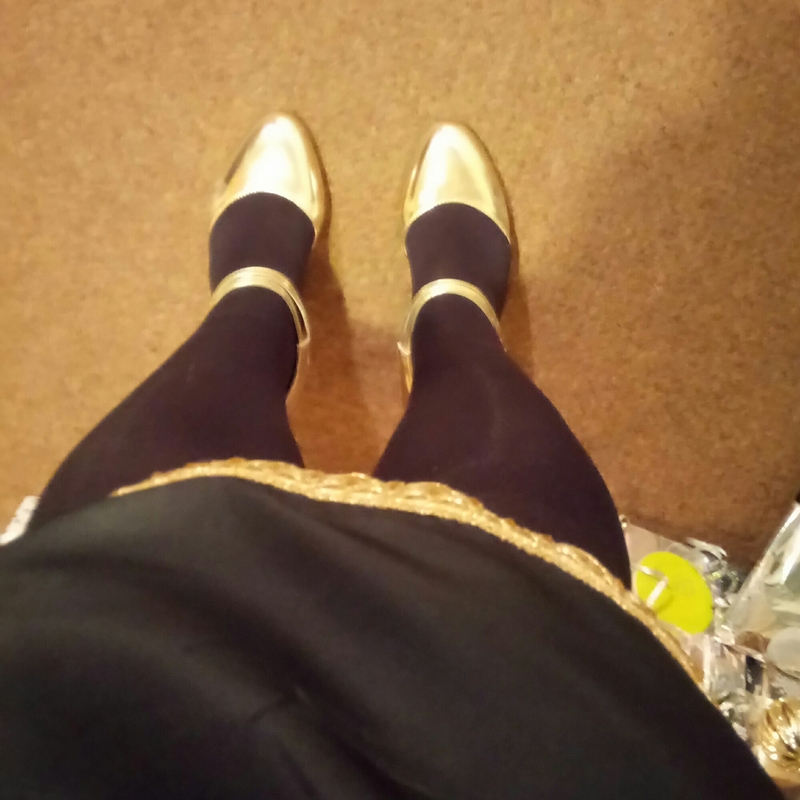 I styled in with black tights and these gorgeous festive gold T-bar shoes… Another reason I didn’t go mad with gold trim- I knew I had gold accessories! The party was a mardi-gras theme and my sister-in-law and I went all out and had my lovely friend Ann do our make-up professionally. I felt really glam and was so pleased to be wearing something I made when I didn’t even know how to sew clothes this time last year. Also, just to add, I borrowed my friends chopstick curlers and oh my God, I’m in hair love! 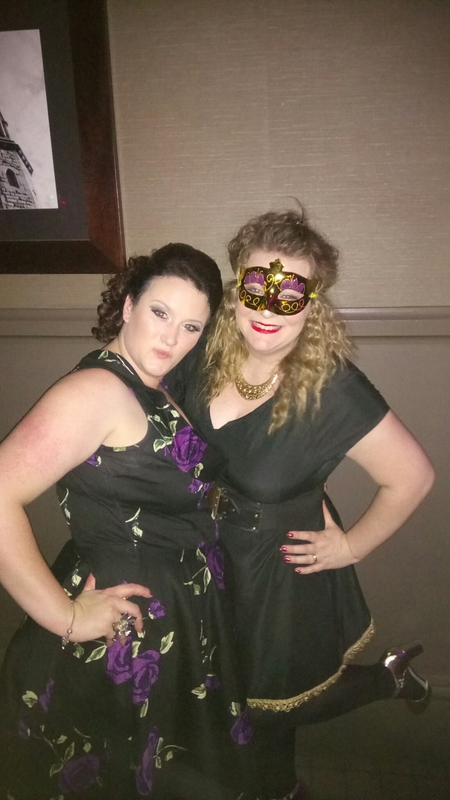 We had a fab time and danced the night away! 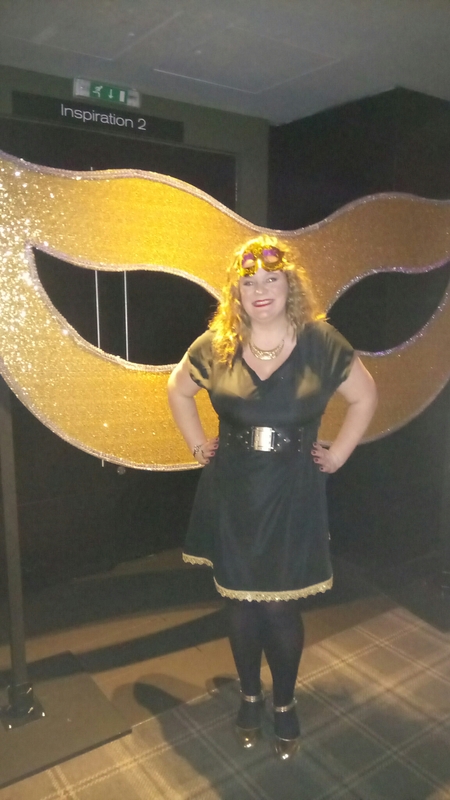 I even bagged myself a matching gold mask, which has since made it’s way on to my Christmas tree! !